I have been performing jazz since about 1981, when I joined former young jazz musician of the year winner John Sanderson's band Expressions, based in the East Midlands. Expressions (including several of my compositions) were featured on BBC Radio Derby. 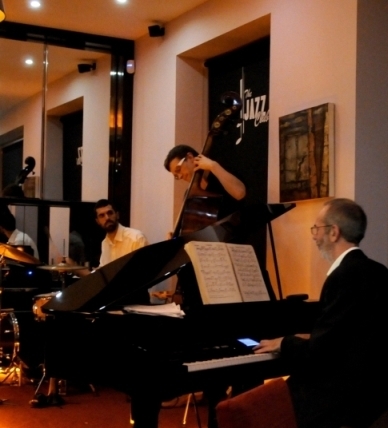 Since moving to Cambridgeshire I have been part of the local jazz scene, regularly appearing on piano in bands such as Mingusology, Andy Bowie Quartet, Cambridge University Jazz Orchestra and others. I have covered every jazz style, from New Orleans to free. I currently do a lot of restaurant gigs or private functions, in solo, duo or larger format. Musicians I've played with include Tina May, Jim Mullen, Gilad Atzmon, Quentin Collins, Simon Spillett, Kevin Flanagan, Nick Hill, Josh Kemp, Gareth Lockrane, Simon Fell, James Allsop, Andrew Brown and many others. For several years I helped to run the Cambridge Jazz Co-operative. I have been teaching piano, and especially jazz piano, since 1991 to pupils of all ages on a one-to-one basis. Pupils who wanted to take exams have been entered for Associated Board and other grade examinations. I currently teach only jazz and music theory. I also play jazz bass guitar - very useful when I'm teaching someone to play piano as part of a band.